I've been monitoring the reaction of folks in social media regarding the NDP'S first full budget since 2000. Most of the comments so far have been very positive. Some have raised a few technical questions, but overall be sense is that the budget is well received. 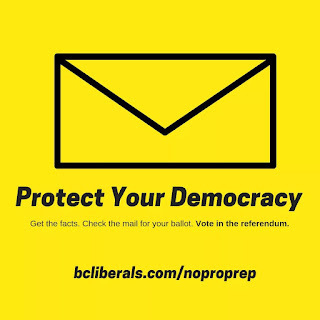 Except if you're a BC Liberal. Naturally. Above all other predictable comments, the notion of a payroll tax of 1.9% on payrolls above $500,000 to replace the MSP premiums isn't being received well. By some. Taken at face value, the criticism has merits. But the policy is good for a number of reasons. MSP was a tax. Used by government to raise funds for general purposes. True, so is the payroll tax, but to free working folks of this fee they had to pay up front should at least count as a tax cut. Exempting small and micro business with payrolls less than $500k means they've not going to be hit with this new fee. My suggestion would be to index the $500k so that businesses under the threshold could give raises and grow without fear of the levy. Sure enough, one anonymous pro-BC Liberal troll who countered my idea with a simple layoff of enough workers to stay under the threshold. That simplistic, knee-jerk reaction reminded me of the early days of the previous BC Liberal government. The issue of the day? The so called "training wage". One of the signature pieces of legislation of the day was to allow for a minimum wage that was $2/h less than the legal minimum wage if the employee had not worked 500 hours in total. The idea was that once you had workplace experience, you'd get the full wage. It was also a one time qualifier. It wasn't meant that you had to satisfy 500hrs at *each* job before getting the slightly higher wage. To nobody's surprise, that's exactly what was done. Some in my family who were in that 'first job' era in their life had to satisfy that 500hrs before obtaining the full wage. Shockingly, that family member was laid off just shy of 500hrs. Even more shockingly, it happened again, and again. We knew what everyone else was saying, the training wage was a favour to an industry that had given very generously to the BC Liberals. A loophole was created that allowed certain employers to avoid paying a proper wage. To be fair, this wasn't widespread, and once the scandal made the headlines, the government removed it. Caught, it seems. Fast forward to today. Literally this day. The discussion around a payroll tax to replace an unfair MSP premium system flips to 'how can I avoid paying wages/taxes' or 'how can I punish my workers'. Because if that's the backbone philosophy of those in the BC Liberal Party, then good riddance. May you never see the inside of power again. Politicians who hate workers should be disqualified from office. Just when the MSM was about to get serious about some honest reporting, this egg was laid by senior political reporter playing the 'both sides' card. Almost on cue. No Keith. The NDP doesn't get the blame for travel expenses that Craig James and Gary Lenz traded signatures on. It was unknown enough that it took Speaker Daryl Plecas by surprise when he dug around for the information. This 'both sides' narrative is a BC Liberal talking point because they know how ethically exposed they are already; this makes matters worse merely a week ahead of the Nanaimo byelection they're poised to lose. Now with this stink out there, it feeds into the narrative that BC Liberals are the party of crony capitalism and insiderism; so lets throw some mud at the NDP and make them to blame too. Nothing in the #plecasreport implicates the NDP government or any of its MLA's or cabinet ministers. In trying to re-define "real estate speculation" Tony Harris accidentally reveals something else. Go ahead, read his article here. The background here is that BC Liberal candidate for Nanaimo, Tony Harris was caught editing out the word 'speculation' on his bio page just ahead of his announcing of his candidacy. For anyone born yesterday or unplugged from the affairs of BC for the last 10 years, real estate speculation has turned the industry into a giant slot machine for developers and realtors. Its become a tough slog for first time home buyers as the average starter home has consistently and dramatically become more out of reach for average folks. None of which is directly to blame on Tony himself. But being given a front page exposure for apparently trying to hide his affinity to the speculation part of real estate seemed that it needed an explanation. So that's where we begin and that's where it gets awkward for Tony. Today, BC Liberal leader Andrew Wilkinson challenged Premier John Horgan to a debate on electoral reform. In an instant, I thought to myself, what a stunningly foolish thing to do. Already, Andrew has been on the wrong side of history on several issues. He's opposed the popular speculation tax.He's opposed the elimination of the MSP.He's opposed ICBC reform.He's opposed the minimum wage increase.He's opposed to electoral reform. But lets talk about electoral reform for a moment. The NDP pledged a referendum to ask voters on an option for a proportional representation based system. Facing defeat, so did the BC Liberals in their ill-fated throne speech. Presumably, Andrew Wilkinson voted for it too. Andrew Wilkinson has effectively made himself the leader of the anti-reform movement in BC. This is problematic in several ways (for him).